WolfeNotes.com » Is DEP Considering Expanding Planned Clearcut At Bull’s Island? Home > Uncategorized	> Is DEP Considering Expanding Planned Clearcut At Bull’s Island? [Update: 9/5/12 – I took a walk on the Island today and – as suspected – DEP is conducting the same Bartlett-like root collar assessment of the trees in the middle portion of the Island. Scores of trees were marked with numbered blue dots, many had yellow tape wrapped around them, and lots had very recent soil excavation around the trunk of the tree to expose the roots. I will file OPRA to get the documents – lets hope they are not thinking about cutting even more trees, but I suspect that they are. Karen Heller of the Philadelphia Inquirer had an excellent column on Bull’s Island that ran yesterday: In clear-cutting plan, losing more than unsafe trees. DEP should be vigilant in removing trees that pose risk. But you don’t remove all mature vegetation, especially after tree experts recommended cutting 56, not more than 200. Why conduct a survey if authorities are going to ignore the experts’ findings? To remove all the trees on Bull’s Island’s northern tip is to make it less of a park, a bird sanctuary, or a natural wonder. As multiple experts point out, and have argued to DEP, removing all those trees puts the park at serious risk, of sullying the Delaware River, of gradually making the place not much of an island at all. Then, of course, all you would have is Bull. Heller is referring to the July 2011 Report by Bartlett Tree Service (Bartlett is a company not known for landscape restoration or ecological expertise, but rather for cutting trees). But I need to clarify a few important issues raised by the column, particularly the DEP Press Office’s latest statements, which not only dig in, but imply that DEP is considering clear cutting an even larger portion of the Island than the 5.22 acres targeted in the Bartlett Report. First of all, the Bartlett report did identify and recommend cutting down 56 “high hazard trees” – this is something to be expected from a firm that specializes in cutting trees. However, while, based only on visual observation, that Report did find that “a majority of trees pose a high to critical risk of failure”, it did not address or recommend clear-cutting. Second of all, the methodology of the Report is fatally flawed (no pun intended). The Report based risks on two factors: 1) visual inspection of tree roots as an indicator of tree health and probability of falling (the probability of falling was NOT quantified); and 2) the presence of people or property in the “target zone” where a tree might fall. However, since the Report was issued, DEP has permanently closed the campsites and plans to remove the rest rooms and playground area. Therefore, there are no people or property present in the area where a tree might fall and thus no risk. The risk factors considered by Bartlett are no longer present and thus the recommendations in the Report are useless. There is no justification to cut ANY trees. None. Nada. Zip. Zilch. Zero. Last, I am very concerned about DEP’s stated position in support of tree cutting; their attacks on critics (who the hell is Voldemort? 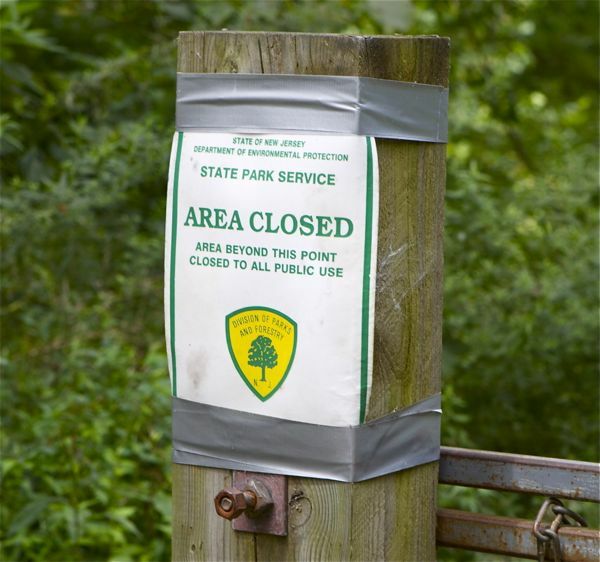 ); and a continued pattern of secrecy and failure to release any information to the public on their tree removal and restoration plans for the Island, a publicly owned State Park. But even worse, despite huge public opposition, DEP seems to be digging in further and expanding the scope of the planned clear-cut. The 88 acres of Bull’s Island can be thought of in three distinct sections: north, central, south. The Bartlett Report only focused on and inventoried 180 trees in the northern tip of the Island, roughly 6 acres from the wing dam to the mouth of the D&R Canal. The Report did NOT examine trees in the central portion of the Island, from the wing dam south to the picnic area behind the Park HQ building (to the pedestrian bridge). The southern portion of the Island is already designated a “Natural Area”.